Clay. End of the 5th — beginning of the 4th century BCE. Saint Petersburg, The State Hermitage MuseumInv. No. Б. 2614. Height: 7.2 cm. Clay. End of the 5th — beginning of the 4th century BCE. Inv. No. Б. 2614. Height: 7.2 cm. Side A features a victorious athlete wearing the victory ribbons in his hair. 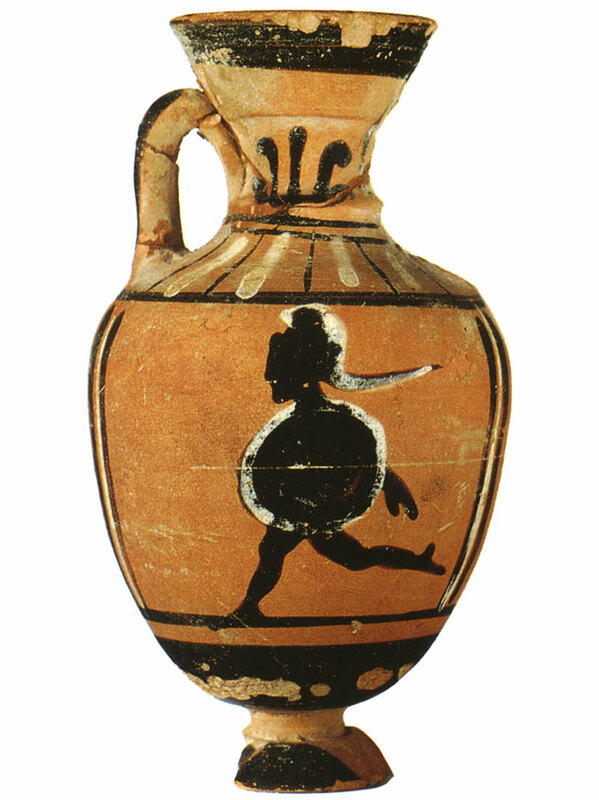 The other side shows an armed runner. He is bearing a shield and wearing a long-crested helmet but is not wearing greaves. K. S. Gorbounova, The Attic black-figure Vases at the Hermitage (Leningrad, 1983) no. 190 p. 211—212. © 1993. Photo, text: Olympism in antiquity. Olympic Museum Lausanne. Bertelsmann UFA. Industria Gráfica S. A. Barcelona, 1993, p. 109 cat. no. 52.